This page is dedicated to various modifications for the Jeep YJ. Most of them either I've done myself or would like to do in the future. I'll try to provide good descriptions, either by myself or others, for most of these. As always, suggested additions are always welcome. If you plan to do much of your own work on your Jeep, you should really consider getting a factory service manual. These things are a million times better than a Haynes or Chiltons manual, since they're designed to be used by factory service centers. I took advantage of beautiful weather and my day off on Presidents' Day '97 to upgrade my stock 15 gallon gas tank to hold 20 gallons. Here's how I did it. The rear bumperettes that come stock on a YJ are pretty useless. I wanted something that gave me rear tow hooks and a 2" receiver hitch. I went with this design. Now that I have a garage, I decided to make a hanger/hoist for storing my hard top during the summer. Here's how I did it. After complaining of a sore leg after my last few road trips, I broke down and installed cruise control. With as much gear as I have banging around in the rear of my Jeep, I wanted to protect my tub from scratches and rust, so I applied JC Whitney's paint-on bed liner. I got tired of looking for the nearest gas station to air back up after a day of wheeling, so I installed a York-based on-board air compressor in the fall of '97. Having only floor and defroster vents gets cold in the winter, so I redirected half of the floor vents to point up toward the seats. Here's how I did it. This isn't really a modification, but more of a fix. I know of a couple hard-topped YJ's, including my own, that have had the triangular vent window pried out of the window frame during break-ins. The dealer says that's a $170 job. Here's how to replace it yourself. After installing my York compressor and ordering a Premier Power Welder, I needed a way to adjust the engine speed without pushing the accelerator. A hand throttle fit the bill perfectly. After the aforementioned break-in, I needed to get a new, secure, waterproof center console before it came time to take my top off for the summer. I installed a Tuffy Deluxe Stereo Security Console and a CB radio (or two, or three) to put in the radio compartment. After I acquired on-board air and a Premier Power Welder, I decided I better make the engine compartment a little more secure, so I installed a hood lock. OK, here's the on-board Premier Power Welder I've been talking about. I bought it in lieu of a normal 115V MIG welder because I didn't have electricity in my garage. Did I make a mistake? '91-'95 YJ's and XJ's have a throttle body restrictor that limits the flow of air between the air box/filter and the intake manifold. Jason Smith describes how to gain 10 hp by removing the restrictor. Many folks, myself included, don't notice any difference. Frequent wheeling while heavily loaded with gear is hard on a spring pack. My rears had developed a significant negative arch when loaded, so I installed an additional main leaf in each spring pack (Rubicon Express 1.5" lift leaves). Three months later, I finally installed longer shocks. It's amazing what correct-length shocks will do for ride quality. The combination of an alternator problem, an old battery, and -5 F temperatures threatened to make me bike to work in the morning, so I grabbed a new Optima 800U battery. These can be bought rebadged as an Interstate Batteries AGM-800DT, which gives you a better warranty and allows you to find them at your local Interstate battery dealer. I got sick of banging my undercarriage on stuff a long time ago. On 10 April 99, I finally got rich enough to do something about it, so I did a massive spring-over-axle conversion. After several years of using a pry bar as a poor-man's sway-bar quick disconnect, I broke down and made my own set from some old stock links for about $5. After a rear-end collision broke my factory driver seat, I opted not to even try fixing it, and instead replaced it with a Bestop TrailMax Pro. After nearly three years of running stiff add-a-leaves, I finally broke down and installed greaseable main eye bushings to help smooth out my on-road ride. I finally got tired of denting my hood or locating a towel whenever I laid my hood back against the windshield, so I installed a second set of hood bumpers to act as cushions. 6" of lift makes the tall headlights on a YJ even worse in the fog and rain. When some friends and I decided to make a night-time wheeling run, I figured it was finally time to install some auxiliary fog lights. Regardless of how much axle articulation you've got, open diffs don't work well on loose or slippery hill climbs. I installed a used Trac-Lok limited slip differential to remedy the problem without risking the breakage that a full locker generally brings to a Dana 35. Now that I've got a tow rig, I decided to setup my YJ for flat towing. This included installation of a tow bar and trailer wiring. This is more of a repair than a modification, but there were some tricky parts, so I did a write-up on replacing a Dana 30 inner axle seal that had started leaking on me. Three years after getting larger tires, I finally got some new wheels with less backspacing, which cleared up several annoying problems. My catalytic converter died on me after 7 years and 50K miles, so I upgraded to a high-flow, stainless steel Random Technology cat as a replacement. My stock radiator started leaking about the same time my cat died, so I replaced it with an all-brass 3-row radiator. I picked up an old, used Warn 8274 winch on eBay. I hope to someday figure out a way to mount it lower than normal so my radiator can still see the light of day. After a few wheeling trips with more aggressive than normal driving, I managed to bend the tubes on my D35 rear axle, which then grenaded the differential innards. I replaced it with a Ford 8.8" out of a Ford Explorer. I finally bought a used Bestop Supertop to complement the hard top that my YJ came with. My top was an older model intended for a 1970's CJ-7, so there were some issues with installing it on my YJ. This is more of a fix than a modification, but I'll link it from here anyway. In cold weather, the passenger side door would refuse to unlock with the key. I had to dismantle the door and reshape a bracket that had gotten bent. I've fixed this twice now in nine years, so I decided to write up the instructions. After 15 years, my front left hub/wheel bearing started to die on me. It was relatively easy to replace. My stock muffler made it 17 years before it finally started falling apart from the inside out. I replaced it with a Pacesetter TFX Kat-Back exhaust. Fifteen years after installing my SOA lift and new shocks, the bushings on those shocks wore out, so I replaced them with new Energy Suspension polyurethane shock bushings. This is also more of a fix than a modification, but after 19 years, my clutch master cylinder started leaking and had to be replaced. If you want a significant (5.5") suspension lift, but don't want to sacrifice ride quality, about your only option is to install a spring-over-axle (SOA) conversion. Rubicon Express makes the only known kit ($360), but many people do a custom conversion themselves. Larry Soo has written an excellent (lengthy) description of how install the RE kit. Craig Myers has also written detailed instructions of his RE installation. Chris Waterman wrote a great description of his custom SOA swap with EB axles. Since the rear driveshaft on YJ is quite short, serious lifts create some pretty steep driveline angles. One way around this problem is to install a tailshaft conversion / slip yoke eliminator kit. Several companies sell these. 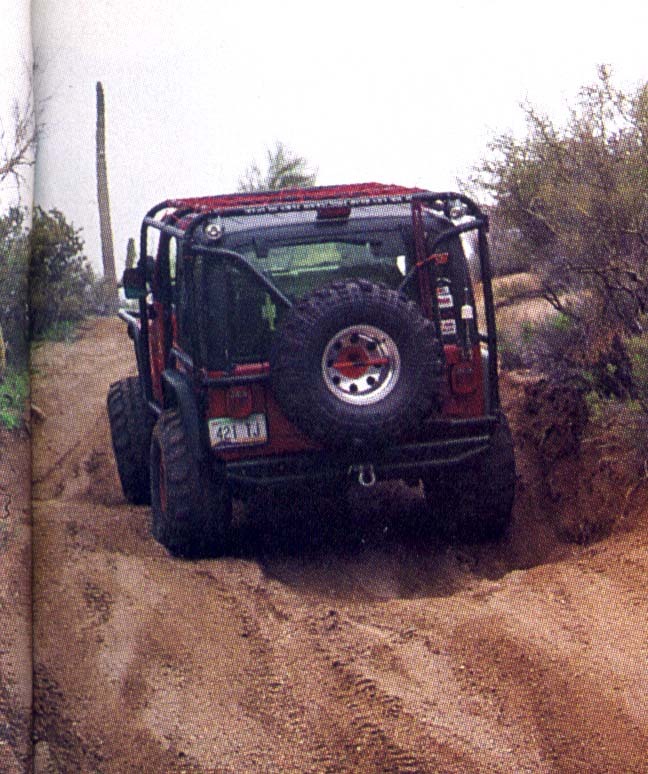 The May '98 issue of Petersen's 4-Wheel & Off-Road had a good article about this and other ways to improve the NP231. Currie makes a kit for $510. They'll buy back your tailshaft core for $250. Many people handle the driveshaft angle problem by installing a CV joint at the t-case end of the rear driveshaft. This is usually done in conjunction with the slip yoke eliminator mentioned above. Plan on spending around $250 for a new rear CV driveshaft. Everyone seems to recommend Tom Wood at Six States Distributors as the best source. Petersen's 4-Wheel and Off-Road magazine's September '97 issue had a good article on driveline angles that you may find informative. If you ever need to make trail repairs to broken steel, you'll probably want an on-board welder on your rig as well. While there are commercial products available (like Premier Power Welder and MobiWeld), Jon Hylands has written a good description of how to build a low-buck welder on your rig. 225/75R15 (28.3") 30" 31" 32" 33" 35"
215/75R15 (27.7") 235/75R15 (28.9") 30" 31" 32" 33" 35"
The gears themselves are fairly inexpensive, but the labor costs will kill you. Gear sets are roughly $200-250 apiece (including installation kits); labor is generally to $300-500 per end. Installing new gears is one area where you really don't want to try it yourself unless you're sure you know what you're doing. Gears that aren't setup exactly right will wear out very quickly. If you like your gear ratio on the street, but still want a better crawl ratio, another option is to lower the gearing on the low range of your transfer case. Two popular options for the YJ are to get a new planetary gear from 4-to-1 Manufacturing that reduces the stock NP231's 2.72:1 low range to (you guessed it) 4:1. That runs about $1100-1400. Another option is to replace the NP231 entirely with Advance Adaptors' new Atlas II transfer case, which has a low range of 3.8:1 or 4.3:1. List price is $1800. If you travel on loose ground or large rocks, some sort of traction control device comes in very handy. With the stock open diffs, you could end up two-wheeling while rolling backwards down the trail. Limited-slip Trac-Locs come optional from Jeep. Several companies also make full-time lockers. My personal favorite is the ARB air locker (or here for more info), which allows you to switch between open diffs and full lockers with the flip of an in-cab switch. The locker unit runs about $600, and the compressor is about $200. Jim Bailey lists reasons and and instructions for bypassing the ARB compressor altogether, even when using ARB lockers. Many people like the added security of having a heavy-duty battery under the hood. This comes in handy not only during cold morning starts, but also when winching or running other high-current accessories. The most popular battery seems to be the Optima, a $130 gel-cell which offers 800 cold cranking amps. Many people also go with dual battery setups so that if one dies (either while winching or because you left your lights on), you still have plenty of juice to keep going. Painless Wiring offers two such setups for $130 and $235. 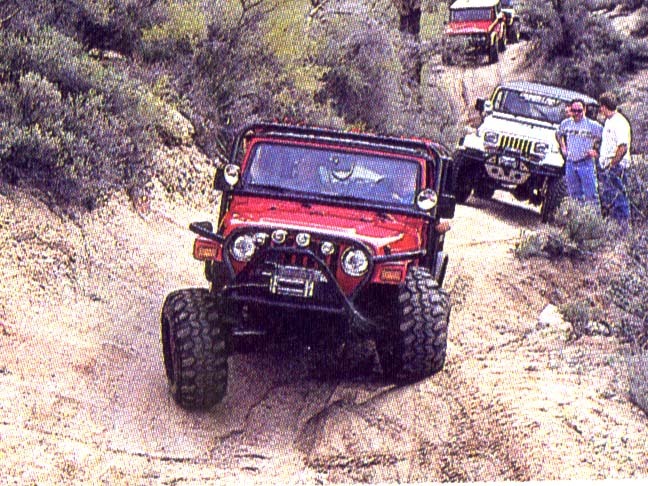 Of course, the ultimate way to get you or your buddies unstuck is to have a winch. You generally want a winch that's rated for at least 150% of your vehicle weight (or the weight or whoever you're pulling out). 8000-9000 lbs is enough for most Jeeps. The pros and cons of various winches are too numerous to list here, but Petersen's 4-Wheel and Off-Road magazine's May '97 issue had an excellent special section on electric winches, and their Nov '97 issue compared electric vs hydraulic winches. The most popular winch makers are Warn, Ramsey, Superwinch, and MileMarker. Cory Brown has compiled a good list of vital stats for most electric winches. Plan on shelling out $500-1000, not including the mount. The stock axles on most short wheelbase Jeeps have less than stellar reputations. The Dana 35C is particularly wimpy. Swapping in heavy-duty axles is the obvious remedy. Custom-built axles can get pricy, so most people find stock axles from other, larger vehicles. Dana 44's are easy to find and strong enough for all but the most serious rigs, so they make popular swaps. Full roll cage, possibly external. One example cage I found is pictured here and here. A Land Rover D110 has an OEM external cage. Dana 44's front & rear, possibly from a Scout, full-size Cherokee or Wagoneer, F-150, or early Bronco. I don't want to waste money putting lockers & low gears into those wimpy stock axles. So you think your Jeep 4-cyl engine is underpowered? Welcome to the club. Fortunately, there are several things you can do to improve the situation. I'm not sure where else to put this, so it's going on this page. I've found that no parts place's computer lists the correct fan belt length for my '95 2.5L YJ (power steering, no A/C). The correct part is a 79.5" (21x2020 mm), 6-rib serpentine belt, such as the Gates Micro-V model K060790. Some folks think that the last three digits in the model number are the length of the belt in tenths of an inch. In reality, the length is usually slightly longer than that number. The 790 is a 79.5" belt, the 490 is a 49-5/8" belt, etc. Very few parts stores around here stock my fan belt, so finding one is sometimes hard. Just be sure to ask for it by length and not by vehicle. ... Upon further inspection, it appears I may have a TJ engine (it's labeled as a '96 engine). Next time I buy a belt, I'll try asking for a '97 TJ or '96 XJ belt and see what I get. Paul Weitlauf comments, "That ought to explain a lot of weird things that are seen from time to time that are claimed to be 'factory' - including V8 Tuxedos and CJ-5 duallies with a different bolt pattern on the rear axle." While no longer an official company policy, randomly using left-over parts is still common today at Jeep.